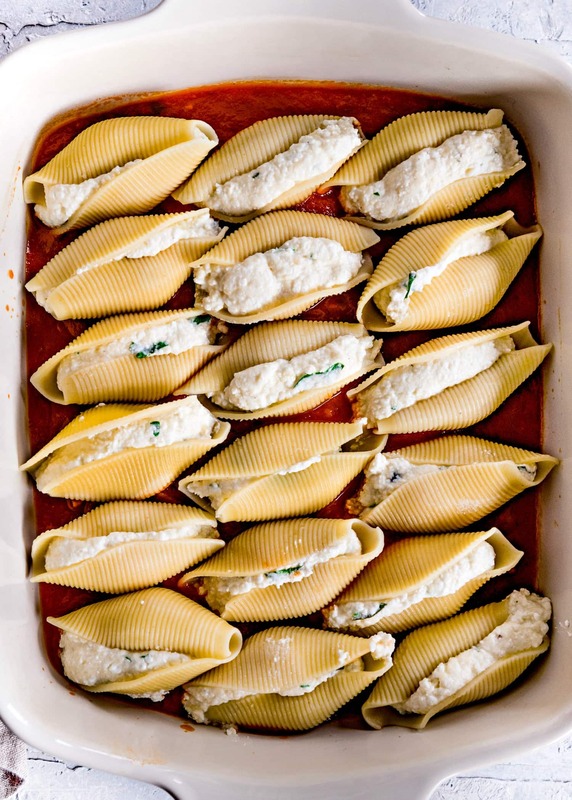 Delicious Stuffed Shells are the perfect easy, weeknight dinner. 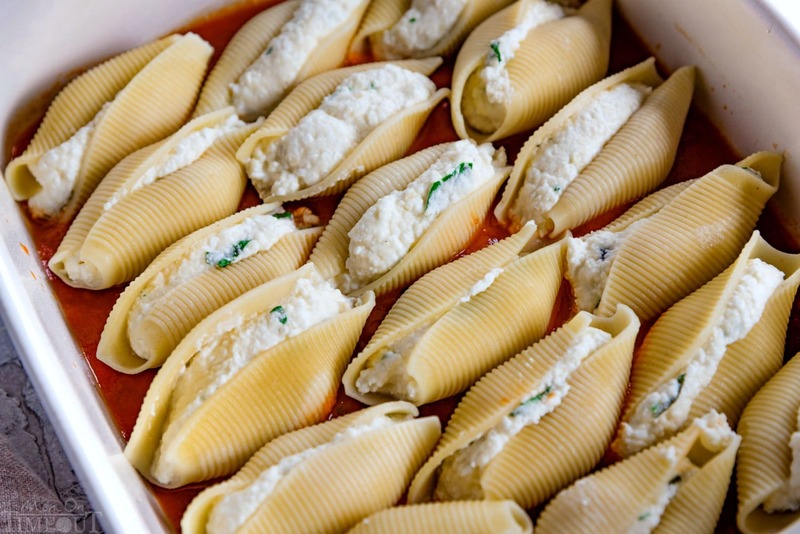 Jumbo pasta shells are stuffed with a smooth, creamy, cheesy filling flavored with fresh herbs and baked to absolute perfection. Make sure to try these Garlic Parmesan Breadsticks or The BEST Dinner Rolls to go with these Stuffed Shells! 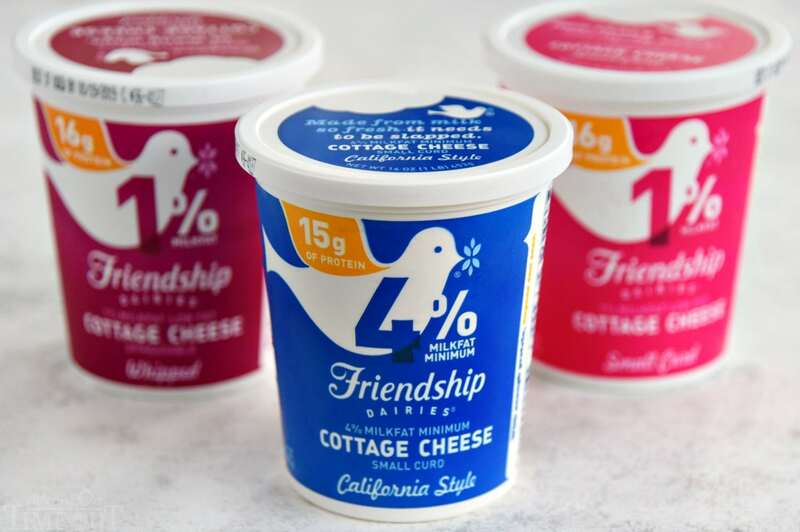 This post is sponsored by Friendship Dairies cottage cheese. 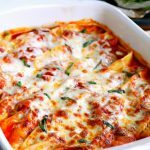 I’m a sucker for easy pasta dishes for weeknight dinners and Stuffed Shells is one of my favorites. There is just something so homey and comforting about stuffed shells. 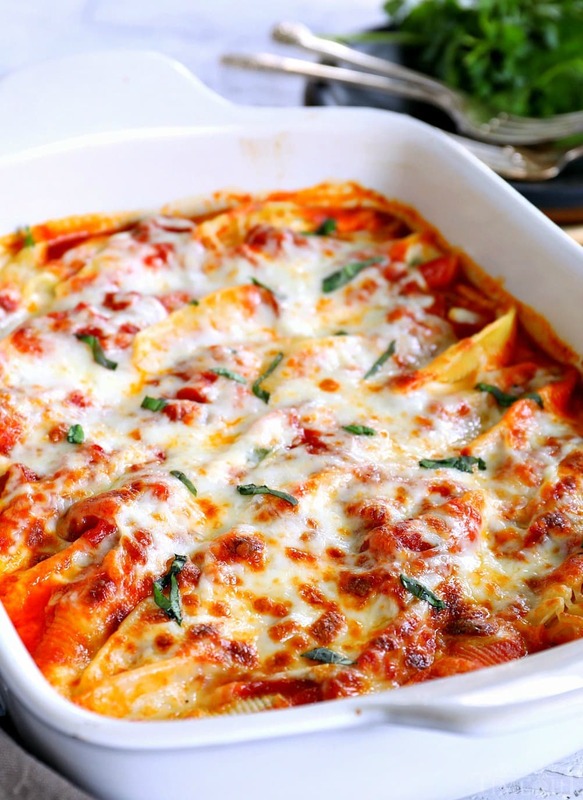 All that cheesy goodness tucked inside pasta shells and baked to perfection in a tasty marinara sauce. Toss together a nice salad and serve with some dinner rolls and you’re off to the races. Today I’m sharing a classic stuffed shells recipe with a fun little twist. I love how versatile this recipe is and please, feel free to adapt it to suit your needs and preferences. The filling in these shells is super simple but is easily customizable. Want to add spinach? No problem. Well drained frozen cooked spinach can be mixed right in. Have some extra Italian sausage or ground beef lying around? This recipe is perfect for using it up! You can either cook it and mix it into the sauce or simply add it to the filling before stuffing the shells. Instead of using ricotta cheese, I opted for Friendship Dairies Whipped Cottage Cheese for this recipe. With less calories and fat and a wonderfully smooth consistency, the cottage cheese creates a lovely filling and the flavor is just right. You could also use a small curd cottage cheese instead of the whipped should you prefer. Parmesan cheese – you can use Rarmigiano Reggiano, a Parmesan Romano blend, or any other real Parmesan cheese product. garlic – my recipe calls for just one to two cloves so use your discretion. Okay, so I am definitely one for efficiency and honestly, it would take me about 10 minutes to fill the shells with a spoon. I just don’t have it in me. Besides, it can be super messy. I frequently end up with more shells and filling than will fit in my 9 x 13 baking dish. In these cases, I just throw the extra in a small baking dish or ramekin and try to make it a good amount for lunch the next day. Love it! 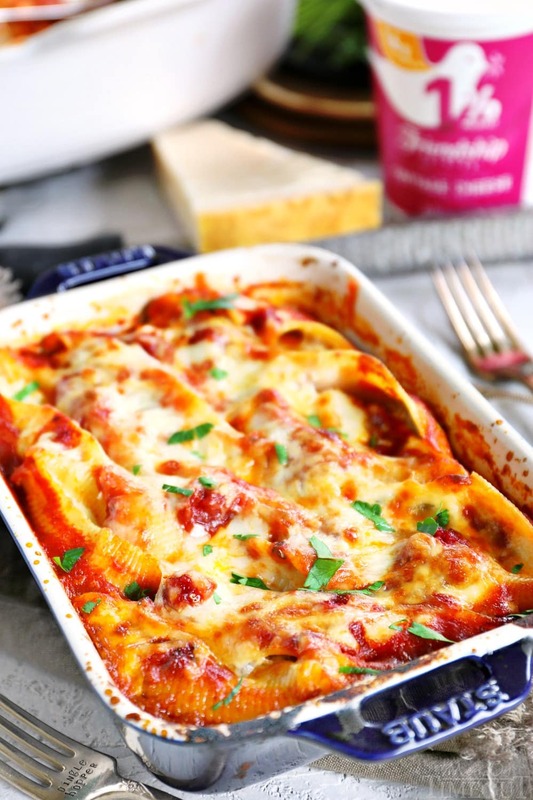 Dinner simply doesn’t get easier than this and I know you’re going to love these yummy stuffed shells! Make sure to use your favorite marinara or pasta sauce for the best flavor! 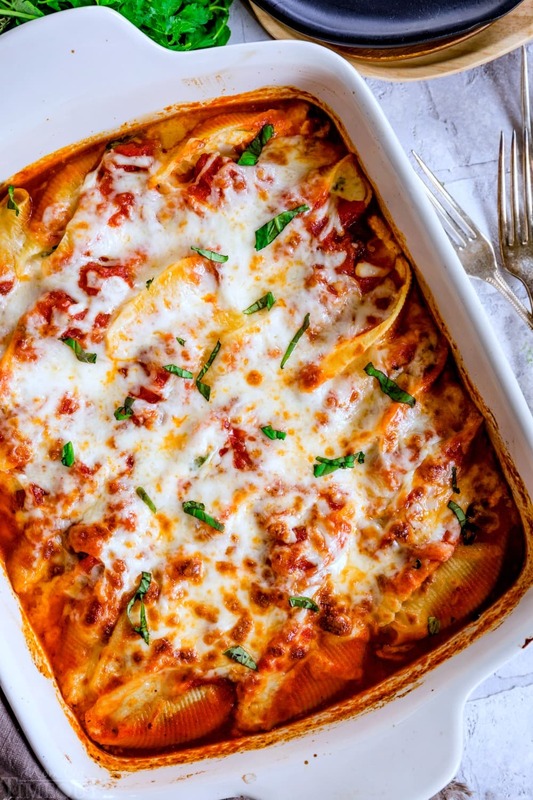 Delicious Stuffed Shells are the perfect easy, weeknight dinner. Jumbo pasta shells are stuffed with a smooth, creamy, cheesy filling flavored with fresh herbs and baked to absolute perfection. Spray a 9x13 baking dish with cooking spray. Spread half of the marinara sauce on the bottom of the dish. Set aside. Bring a large pot of salted water to a boil. Add pasta shells and cook pasta shells until 3 minutes shy of al dente - according to the package directions. Drain pasta shells and rinse with cool water. Set aside. In a large bowl, combine whipped cottage cheese, Parmesan cheese, egg, garlic, parsley, basil, salt and pepper. Spoon mixture into shells and place shells in baking dish, nestling them in the sauce. Cover shells with remaining sauce and sprinkle mozzarella cheese on top. Bake for 25 minutes or until hot and bubbly. Serve immediately. Your recipe calls for 3/4 cup basil and the video doesn’t show using basil at all. I cut the basil to 1/2 cup and it was still way to much. When I make it again should I use basil at all? It was eatable but needed much less basil..
Hi Lois! The video does show the basil being added it’s right after the garlic and parsley. I think you maybe measured out the chopped basil instead of basil leaves? That would make a really big difference. It’s about 8 to 10 leaves, finely chopped. Thanks!